If you can't trust the numbers in the Holy Bible to be right then how can you trust the words that are between the numbers? The following examples show how modern versions like the NIV, RSV, ESV, NASB disagree with each other and often reject the Hebrew texts that underlie the King James Holy Bible. Numbers do not usually lend themselves to a variety of ways to translate them. That is why this specific study will focus on some of the differences in the numbers found in the various modern versions. All "bibles" are not the same, and they do not all teach the same truths but with different words. Luke 10:1 "After these things the Lord appointed other SEVENTY also, and sent them two and two before his face into every city and place, whither he himself would come." Here Sinaiticus and Vaticanus, the so called oldest and best manuscripts upon which most modern versions are based, differ from each other. These two manuscripts differ in significant ways from each other more than 3000 times in the gospels alone. The reading of SEVENTY is found in the majority of all texts including, A, C and Sinaiticus. The NASB, NKJV, RV, ASV, RSV, NRSV and the ESV all read 70 but the NIV, and the TNIV read "The Lord appointed seventy TWO others". 72 is the reading of Vaticanus. So, was it 70 or 72? Is your Bible the absolute, inerrant word of God or is one of the Probably Close Enuf Versions good enough for you? In Acts 10:19 "While Peter thought on the vision, the Spirit said unto him, Behold, THREE men seek thee." The text says Three men because in verses 7 and 8 there were three men sent from Cornelius, two of his household servants and a devout soldier. Three is the reading of the majority of all texts, A, C and Siniaticus; D omits the number altogether, while Vaticanus has TWO men. Here the NASB and NIV wisely rejected Vaticanus and have "three men." In Acts 19:14-16 we are told of some vagabond Jews, exorcists, who tried to cast out evil spirits in the name of the Lord Jesus. There were SEVEN sons of one Sceva, and in verse 16 we are told "And the man in whom the evil spirit was leaped on them and overcame them." This is the reading of the majority of all texts and the King James Bible. However in "the oldest and best" Siniaticus and Vaticanus there is another word added to the text - the word amphoteros, which means "both". This word is found 14 times in the King James Bible and is always translated as both, as in "Let both grow together", "they were both righteous before God", "he frankly forgave them both" and "he is our peace, who hath made both one." Around 1881 the Wescott-Hort Greek text began to be translated into the Revised Version, and was soon followed in 1901 by the the American Standard Version. This Greek text differs from the Greek text that underlies the King James Bible by about 4000 words. When the RV and the ASV came out they read in Acts 19:16 "the man in whom the spirit was leaped on them and overcame them BOTH." The NASB from 1960 to the 1972 editions also said "subdued BOTH OF THEM." A clear reading of the context shows there were seven sons overcome by the evil spirit, not two. So in 1977 the NASB changed their version to read "overcame them ALL." The NIV reads as does the NASB now. However, there is no word in any text for the word "all". The new ESV (English Standard Version) says in Acts 19:16 "the evil spirit leaped on them, mastered ALL OF THEM and overpowered them..." Then it footnotes: "or BOTH". Well, I'm sorry, but we can't have it both ways. "Both" does not mean "all of them" and the ESV is alluding to the false reading of two corrupt manuscripts. In Acts 27:37 Luke is relating the shipwreck of Paul on his way to Rome. The majority of all texts, and Siniaticus read "And we were in all in the ship 276 souls." But Vaticanus has the unique reading of "ABOUT 76 souls". It is possible to say "about 20, or about 100" but you would not say "about 76." There is a big difference between 276 and "about" 76. The Vaticanus reading is rejected in this place. In Matthew 13:33 all the texts read the same. "The kingdom of heaven is like unto leaven, which a woman took, and hid in THREE measures of meal, till the whole was leavened." Many have seen this passage as representing the progressive introduction of error into the Christian church, affecting the doctrine of each of the three persons of the Trinity. The RV, ASV, NASB, NKJV, RSV, ESV correctly translate the word as "three measures" but the NIV says "a woman took and mixed into A LARGE AMOUNT of flour." The significance of the number Three is lost. The new TNIV (Today's New International Version) now says: "yeast that a woman took and mixed into ABOUT EIGHTEEN POUNDS of flour..." The 2002 paraphrase called The Message says: "yeast that a woman works into the dough for DOZENS of loaves of barley bread." In Matthew chapter 18 Peter asks the Lord Jesus how many times he should forgive his brother. He says: "Lord, how oft shall my brother sin against me, and I forgive him? till seven times?". The Lord answers him in verse 22 "I say not unto thee, Until seven times; but, Until SEVENTY TIMES SEVEN." This is the reading in all Greek texts. The single word "seventy times" (hebdomeekontakis) occurs only once in the entire New Testament and that is here. The RV, ASV, Tyndale, Geneva, Young's, Douay, Darby, NASB, NKJV, and even the new versions of the ISV (International Standard Version), The Message, and the Holman Christian Standard Version all read "seventy times seven" but the NIV and the TNIV read: "I tell you not seven times, but SEVENTY SEVEN times." In 2 Peter 2:5 we are told that God "spared not the old world, but saved Noah the EIGHTH person, a preacher of righteousness, bringing in the flood upon the world of the ungodly." This is the reading of all texts. The Greek word used here is ogdoon and means 8th. The word for the number 8 is ogdos. The word is "eighth" as in "circumcised the eighth day". Agreeing with the King James reading of Noah being the EIGHTH PERSON, are Wycliffe 1395, Tyndale 1525, Coverdale 1535, Bishop's Bible 1568, Geneva Bible 1599, Young's, Darby, and the NKJV. However the RV, ASV, RSV, NASB, ESV and NIV all say "Noah and SEVEN OTHERS." This reading is not found in any Greek text. You may ask, So what is the big deal?. Numbers often have a spiritual significance. Seven is spiritual perfection, and eight is the number of a new beginning. A man child was to be circumcised on the eighth day, Genesis 19:12, signifying a new relationship with the covenant God. The land was to be at rest from the sixth to the seventh year, and the eighth year the children of Israel were to sow there crops again - Leviticus 25:22. There are seven days in a week, ordained by God, and the eighth is the start of a new week. So too with Noah the eighth person and his family after the flood. God began again to repopulate the earth. The number 8 has a spiritual significance of a new beginning. All the texts read this way, and the NASB, RSV, ESV, NIV have no right to change what God has been pleased to give us in His words. In 1 Samuel 6:19 the King James Bible reads: "And he smote the men of Bethshemesh, because they had looked into the ark of the LORD, even he smote of the people fifty thousand and threescore and ten men: and the people lamented, because the LORD had smitten many of the people with a great slaughter." The Bible versions that read 50,070 are the King James Bible, Wycliffe 1395, Coverdale 1535, Bishop's Bible 1568, the Geneva Bible of 1599, the Italian Diodati 1602, Webster's 1833, the Revised Version 1881, American Standard Version 1901, the Spanish Reina Valera of 1909 and 1960, both the 1917 and 1936 Hebrew-English translations from the Masoretic text, the New American Standard Version 1960 -1995, modern Italian, the Modern Greek bible, the Portuguese, French and Rumanian bibles, the World English Bible, the modern Hebrew Names Version, as well as the Third Millenium Bible and the 21st Century KJV. These versions translate what the preserved Hebrew texts actually read. However the NIV, RSV, ESV tell us in 1 Samuel 6:19 "But God struck down some of the men of Beth Shemesh, putting SEVENTY of them to death, because they had looked into the ark of the LORD." The NIV, RSV, ESV just made this number up! The ESV footnote tells us the Hebrew reads "of the people seventy men, fifty thousand men." You have to admit, there is a slight difference between 50,070 men slain, and 70. So, which one is right? My friend and brother in Christ, Martin Shue, has also written a very good article about this passage which can be seen at his Authorized Version Defense site here. In 1 Samuel 13:1 the King James Bible, NKJV, Geneva, Webster's translation of 1833, Lamsa's translation from the Peshitta of 1933, Catholic Douay, Italian Diodati, Spanish Reina Valera, the Third Millenium Bible and the 21st Century KJB say: "Saul reigned ONE year; and when he had reigned TWO years over Israel..."
The NASB 1972 says: "Saul was 40 years old when he began to reign and he reigned 32 years over Israel." The NIV has:"Saul was 30 years old when he became king, and he reigned over Israel 42 years." Gleason Archer, one of the translators of the NIV and the NASB, says in his book Bible Difficulties on page 171 that the Hebrew text here has been lost. Did God lose some of His words or has He preserved them as He promised? Versions like the RSV, ESV actually read this way: "Saul was...years old when he began to reign, and he reigned...and two years." Then in a footnote tell us "the number is lacking in Hebrew and Septuagint." Which reading is correct - ONE/TWO years, or 40/32 or 30/42, or ...years and...and two years? The NASB and NIV not only disagree with each other but contradict Acts 13:21 where we are told that Saul reigned for 40 years. The Hebrew text is not lost. Check out the concordances of NASB - NIV and you will see they have at times translated the words "one" and "year" just as found in the King James Bible. While here in 1 Samuel, in verse 13:5 we read: "And the Philistines gathered themselves together to fight with Israel, THIRTY thousand chariots..." Here the RV, ASV, RSV, ESV, NKJV, NASB read as the King James Bible - THIRTY thousand. But the NIV says "THREE thousand chariots." A footnote tells us in the NIV: Some LXX manuscripts and Syriac 3000, Hebrew 30,000. The NIV tosses out the clear Hebrew text, and substitutes the reading of SOME LXX texts and the Syriac. Why? Because it simply is relying on human reasoning rather than believing God's word as He preserved it. Gleason Archer (Bible Difficulties) says regarding this passage: "Much more likely is the possibility that 3000 was the original number and somehow in later transmission it was miscopied as 30,000. The accurate preservation of statistics is notoriously difficult and 1 Samuel has more than its share of textual errors." It is sad to see so many Christians following the opinions of scholars like Gleason "Scribal Error" Archer, and modern versionists like Hank Hannegraf recommend his book. In 2 Samuel 24:13 we are presented with what at first appears to be a contradiction, but in reality is not. Trust the King James Bible, believe it and you will not go wrong, even if you do not undersand it at first - it is always right. In verse 13 the prophet Gad is sent from God to confront king David about his sin of numbering the people to boast in the power of the flesh. The prophet Gad tells him to choose one of three things that should come upon him. He says: "Shall SEVEN years of famine come unto thee in thy land? or wilt thou flee three months before thine enemies, while they pursue thee? or that there be three days' pestilence in thy land?" Here the Hebrew texts clearly say SEVEN years, and so do Wycliffe 1395, Coverdale 1535, Bishop's Bible 1568, the Geneva Bible 1599, Hebrew Names Version, Jewish Publication 1917 version, the NASB, NKJV, RV, ASV, and the Third Millenium Bible. However the RSV, NRSV, ESV, and the NIV have changed this number to THREE. "Shall there come upon you THREE years of famine in your land?" But the NIV, RSV, ESV all have a footnote that tells us the number "THREE" comes from the Greek LXX, while the Hebrew texts say SEVEN years. Why did they feel free to change this number? In my opinion, it is because they don't believe God has preserved His inerrant words. They are unwilling to solve an apparent contradiction, and they don't know how to properly read the Scriptures. In 1 Chronicles 21:12 Gad is reported as saying to David "THREE years of famine, or three months or three days"- hence the APPARENT contradiction. Is it three years or seven years of famine? The RSV, NIV, ESV editors could not figure it out so they abandoned the Hebrew text, thought God's word was wrong, and went with the LXX reading. The solution is found in 1 Samuel itself, which has the reading of "seven years", and which provides us with information not found in 1 Chronicles. The seven years of famine would be the total number of years of famine in the land. You see, in 1 Samuel 21:1 God tells us "Then there was a famine in the days of David three years, year after year". The famine also continued an additional 9 months and 20 days while Joab went through all the land numbering the people. "They came to Jerusalem at the end of nine months and twenty days." Thus there had already been virtually 4 years of famine upon the land at the time Gad came to David and offered him the three choices. 4 + 3 = 7. Both the numbers 7 years and the 3 years are correct. The King James Bible is right, and the RSV, NIV, ESV are wrong. In case you think I am just picking on the NIV, here is one (of many) for the NASB. In 2 Samuel 23:18 we are told of "Abishai, the brother of Joab, the son of Zeruiah, was chief among THREE." If we compare this with 1 Chronicles 11:20-21 we see that Abishai was one of a group of three men, probably the three mighty men who broke through the lines of the Philistines to get David some water from the well of Bethlehem. He was not one of the chief three over the whole army. Abishai was a captain over the other two mighty men. The NASB follows the liberal RSV, and the new 2001 ESV and says in 2 Samuel 23:18 that Abishai was chief among the THIRTY, rather than the THREE. The RSV, NRSV, and ESV have a footnote which tells us "Thirty" is found in 2 Hebrew manuscripts, and the Syriac, but that the Masoretic text says THREE. Agreeing with the King James Bible reading that Abishai was chief of the THREE, and not the THIRTY of the NASB, are Wycliffe 1395, Coverdale 1535, Bishop's Bible 1568, Geneva 1599, the NIV, NKJV, Revised Version, the American Standard Version (the precursor to the NASB), both the 1917 and 1936 Hebrew-English translations from the Masoretic text, and the modern Hebrew Names Version, even the LXX, the Spanish of 1909, the Italian Diodati 1602, Websters 1833, Youngs, Darby, Douay, Third Millenium Bible, World English Bible, and the Living Bible. So even the NIV and the ASV differ from the NASB. 2 Samuel 15:7 forty years or four years? In 2 Samuel we read of Absalom's rebellion against his father king David. Verse 7 says: "And it came to pass after FORTY years, that Absalom said unto the king, I pray thee, let me go a pay my vow, which I have vowed unto the LORD, in Hebron." Here all known Hebrew texts read FORTY years. The versions that agree with the King James Bible are the NKJV, 1917, 1936 Hebrew-English versions, the NASB, Revised Version, American Standard Version, Douay, Geneva, Darby, Spanish, Young and many others. However, the NIV, RSV, NRSV, and ESV read "after FOUR years Absalom...". The footnote in the RSV and NRSV says the number 4 comes from the Greek and Syriac, while the Hebrew says 40. The NIV footnote says SOME LXX, Syriac and Josephus say 4 while the Hebrew says 40. My copy of the LXX says 40. The NKJV also includes the sitting on the fence footnote of "Septuagint manuscript, Syriac and Josehpus have 4". The scholars like to help one another out in sowing disbelief and doubt, don't they? Rather than believing God knew what He was doing when He said 40, the NIV, ESV editors thought 40 years was impossible, it must be wrong, so we will follow the traitor Josephas instead of what God recorded in all Hebrew manuscripts. There are three possible ways I know of to explain this number of "after 40 years". One possibility is the number refers to 40 years after his father David was originally anointed to be king, before he actually took the throne. See 2 Samuel 2:4 and 3:1. A second possibility is the 40 years refers to the age of Absalom himself at this time. A third possibility, and the one I find the most likely, is the 40 years refers the time when David invaded the Geshurites and killed off the men, women and children. Absalom's mother was daughter of the king of the Geshurites, (2 Samuel 3:3), and it could well be that Absalom was taking revenge upon David on behalf of his mother. In the context of "after 40 years" the very next verse mentions Absalom's vow that he had taken while he abode at Geshur in Syria. I think God puts things like these difficult numbers in his precious word to cause Bible critics to stumble and to reveal their unbelief and readiness to exchange the words of God for carnal, human reasoning. "I will destroy the wisdom of the wise, and will bring to nothing the understanding of the prudent." 1 Corinthians 1:19. Jeremiah 6:19-21 "Hear, O earth: behold, I will bring evil upon this people, even the fruit of their thoughts, because they have not hearkened unto my words, nor to my law, but rejected it...Therefore thus saith the LORD, Behold, I will lay stumblingblocks before this people, and the fathers and the sons shall fall upon them." There are a multitude of Bible critics who insist the King James Bible is in error when it translates the Greek word daimonion as "devils". They tell us this word should be translated as "demons" and not devils, because everyone knows there is only one Devil, that is Satan, and not many. Let's do a little word study to see if there is any legitimacy to their claims. The late Baptist pastor and King James Bible defender Bruce Lackey wrote a little book titled Why I Believe the Old King James Bible. On pages 44-48 he says regarding the use of the word devils and other alleged errors in the King James Bible: "Rather than treat these places as errors, why not remember that the King James translators were intelligent and reverent scholars, and try to find out why they did a particular thing in the way that they did?" "(1) The word translated Odevil," when referring to Satan, does not always refer to him; DIABOLOS is translated Oslanderers" in 1 Timothy 3:11, and as Ofalse accusers" in 2 Timothy 3:3 and Titus 2:3. In all three places, it refers to human beings. Again, we see the necessity of translating in a manner which will be understood by the readers. "(2) Devil in the English language has multiple meanings; it may refer to Satan, demons, a very wicked person, an unlucky person (that poor devil), a printer"s devil (apprentice or errand boy) as any good English dictionary would show. To say that Odevil" is an erroneous translation, because it can only refer to Satan, is to ignore the dictionary!" - Mr. Bruce Lackey. I might add that to affirm there is only one Devil and this is Satan is also incorrect. In the gospel of John, immediately after Peter said: "Lord, to whom shall we go? thou hast the words of eternal life. And we believe and are sure that thou art that Christ, the Son of the living God", the Lord Himself answered them: "Have not I chosen you twelve, and one of you IS A DEVIL." The Lord was obviously referring to Judas Iscariot, and mere man, yet He calls him a devil - DIABOLOS. Let's look at some of the English dictionaries Mr. Lackey referred to. 1. Devil - In many religions, the major personified spirit of evil, ruler of Hell, and foe of God. Used with the. Demon - Likewise these dictionaries give the following definitions for "demon". Notice numbers 2 and 3. New Agers today refer to daemons as good spirits who guide us in this life. I have heard some of the lectures on the Power of Myth by the late Joseph Cambell. He frequently used the word "daemon" in a positive way as some sort of spiritual guide. I'm sure he now knows how wrong he was during his lifetime. Shakespeare also used the word daemon (demon) is a positive way. Therefore, O Antony, stay not by his side. Thy demon, that thy spirit which keeps thee, is Noble, courageous, high, unmatchable Where Caesar's is not. But near him thy angel Becomes a fear, as being o'erpow'red. . . --Antony and Cleopatra, II.iii.18-22. Basilides, in his book The Seven Sermons to the Dead, translated by Carl Jung (another New Ager) says: "The daemon of spirituality descends into our soul as the white bird. It is half human and appears as desire-thought... The White Bird is a half-celestial soul of man. He bids with the Mother." Another point I have never seen raised by these modern version proponents who criticize the King James Bible has to do with the New Testament Greek itself. They love to "go to the Greek" to show us their expertise and convince us of the alleged errors in the Holy Bible. Regarding the Greek words daimon, and daimonion, which are translated as "devils" in the King James Bible, and as "demons" in the NKJV, NIV, NASB, several Greek lexicons give us the following definitions. Liddell and Scott's Greek-English Lexicon 17th edition 1878 says the verb daimonizomai means "to be possessed by a devil." It then goes on to define daimonion as "an inferior race of divine beings". Thayer's Greek Lexicon says daimonion is 1. the Divine power, deity, divinity, and 2. a spirit, a being inferior to God, superior to man, in both a good and a bad sense. Bauer, Arndt & Gingrich likewise tell us daimonion is 1. a deity, a divinity, 2. a demon, an evil spirit. Kittel's massive work says of both daimon and daimonion that they are first used to denote gods. They can also refer to lesser deities or a protective deity. They also are "messengers between gods and men". Many modern versions themselves are inconsistent. Versions like the NIV, RSV, NRSV, ASV, and Darby render the noun and verb (daimonion, daimonizomai) as "demons" and yet when they come to the adjective of this word in James 3:15 (daimoviwdns) they translate it as "devilish" or "of the devil". "This wisdom descendeth not from above, but is earthly, sensual, DEVILISH." - James 3:15. The Greek New testament, no matter which one you choose with all the textual variations, all agree in Acts 17:18. Here we see from the New Testament Greek itself the relationship between daimonion and the gods. Remember, the word daimonion meant in Greek mythology an intermediate spirit between the gods and men. In Acts 17:18 we read: "Then certain philosophers of the Epicureans, and of the Stoicks, encountered him. And some said, What will this babbler say? other some, He seemeth to be a setter forth of strange GODS: because he preached unto them Jesus, and the resurrection." The word here translated as "gods" is daimonion, the very same word translated as "devils" in the KJB and many others, and as "demons" in the RSV, NASB, NKJV, ESV, and NIV. Demons = gods. Another Greek word found in the New Testament shows again this relationship between the daimonion (devils) and religion. In this same chapter (Acts 17:22) the apostle Paul walked around the city of Athens and observed their devotions and altars of pagan gods. Paul says to them: "Ye men of Athens, I perceive that in all things ye are too SUPERSTITIOUS." The word translated as "too superstitious" in the King James Bible is composed of two elements - Deisi and daimonesterous. The first part is the verb deido which means to fear, and the second part is an adjective from the noun daimon, which means devils or demons. The word daimon is used six times in the New Testament and is always translated as devils in the KJB. What we see here in the Greek language is that the words daimon, and daimonion can both carry the idea of a positive and beneficial spiritual entity. The King James translatos were aware of this, and correctly translated these words as "devils". The word "devils" is directly related to the Devil and we are in no doubt as to which side they are on. Martin Luther was not confused about this issue when he composed his famous song, A Mighty Fortress is Our God. One of the lines of this great song is: "And though this world with DEVILS filled should threaten to undo us, we will not fear, for God hath willed, His truth to triumph through us." Most modern versions have removed the word "devils" when it refers to unclean or evil spirits. These include the NKJV, RSV, NASB, NIV and the ESV. Tyndale 1525, Coverdale 1535, Bishop's Bible 1568, the Geneva Bible 1599, the Revised Version 1881, Webster's 1833 translation (Deut. 32:17; 2 Chron. 11:15), Douay Rheims 1950, Jerusalem Bible 1968, New American Bible 1970, Lamsa's translation of the Syriac Peshitta 1933, the New English Bible 1970, J. B. Phillips (Luke 11:19), the KJV 21st Century, the Third Millenium Bible, the 2001 Easy to Read Version (Psalms 106:37 "God's people killed their own children and offered the children to those devils. "), and the modern 2002 paraphrase called The Message - Isaiah 34:14, Matthew 12:27, 45; Luke 11:19 "but if you're slinging devil mud at me, calling me a devil who kicks out DEVILS, doesn't the same mud stick to your own exorcists?". Those who criticize the King James Bible for using the word devils instead of demons apparently do not understand either the Greek or the English language very well. They are like those described in 1 Timothy 1:7 "Desiring to be teachers of the law; understanding neither what they say, nor whereof they affirm." At the beginning of this little study we quoted 1 Timothy 4:1 where the Spirit speaketh expressly that in the latter days some would depart from the faith, giving heed to seducing spirits and doctrines of devils. Without exception, I have found that those who criticize our beloved King James Bible do not believe that any single text or Bible version, be it in Hebrew, Greek, English, Swahili or whatever, is the complete, inerrant, inspired, and pure words of God. In regards to the Bible version issue, the modern scholars have adopted the methods and beliefs of liberal apostates who tell us the Hebrew Masoretic texts have been corrupted and the Greek texts are uncertain and in need of constant research and updating. They have no infallible Holy Bible to give us and they ridicule those of us who believe God has preserved His pure words and that today and for almost 400 years they are found in the King James Holy Bible. I have personally been called an ignorant fool, an apostate, and even demon possessed because I believe God meant what He said about heaven and earth shall pass away but His words would not pass away. There are two basic views hotly debated among Christians today concerning the Bible version issue. You are on one side or the other. #1. Believing God has kept His promises to preserve His words and has given us an inerrant Bible or #2. Believing there is no such thing as a complete, inerrant, and perfect Bible on the face of this earth? Now which of these two views do you think is a doctrine of devils? 3. Rejoice or Be Proud? In the true Holy Bible boasting in oneself is never commended as a good thing. Scripture allows for boasting in the accomplishments of others, but not in ourselves. For example, see 2 Corinthians 7:14; 8:24, and 9:3-4. Here the apostle Paul boasted to others of the Corinthians because they were ready to provide for the needs of the poor saints in Jerusalem. Boasting in oneself is done only in a sense of irony, and is called "folly" and speaking foolishly - See 2 Corinthians 11:1, 10, 16-18 "That which I speak, I speak it not after the Lord, but as it were foolishly, in this confidence of boasting. Seeing that many glory after the flesh, I will glory also." Pride and boasting in oneself is always condemned in the King James Bible as being a sin. Many new versions however have completely turned this around in several verses of Scripture, and have now made pride in self and boasting to be Christian virtues. Compare the King James Bible with the NASB, NIV, ESV, and NKJV in these verses. Galatians 6:4 KJB "Let every man prove his own work, and then shall he have REJOICING in himself alone". This is the reading of Tyndale 1525, Coverdale 1535, Bishop's Bible 1568, Geneva Bible 1587, John Wesley's 1755 translatioin, Webster's 1833 translation, the NKJV 1982, KJV 21st Century, and the Third Millenium Bible. However the NASB says "he will have REASON FOR BOASTING in regard TO himself"; NIV "he can TAKE PRIDE IN HIMSELF", and the ESV says: "then his REASON TO BOAST WILL BE IN HIMSELF ALONE." James 1:9 KJB "Let the brother of low degree REJOICE in that he is exalted." NIV "the brother in humble circumstances OUGHT TO TAKE PRIDE IN his high position." RSV, ESV "Let the lowly brother BOAST IN his exaltation." 2 Corinthians 1:12, 14 KJB, Tyndale, Coverdale, Bishop's, Geneva, TMB, and others: "For our REJOICING is this...by the grace of God we have had our conversation in the world...we are your REJOICING, even as ye also are ours in the day of the Lord Jesus." NASB "For our PROUD CONFIDENCE is this...that in holiness...we have conducted ourselves in the world...we are YOUR REASON TO BE PROUD, as you also are ours..."
NKJV, NIV, RSV, ESV "Now this is our BOAST...we behaved ourselves in the world...YOU CAN BOAST OF US just as we will BOAST OF YOU in the day of the Lord Jesus." 1 Thessalonians 2:19 KJB, NKJV, Youngs, Tyndale 1525, Coverdale 1535, Bishop's 1568, Geneva 1599, Wesley 1755, Webster's 1833, Third Millenium Bible: - "For what is our hope, or joy, or crown OF REJOICING? Are not even ye in the presence of our Lord Jesus Christ at his coming?" The NASB is OK here with "what is our crown of exultation? ", but the NIV begins the slide into pride with "What is the crown in which we will glory"?, and the RSV, and the 2001 ESV go all the way saying: "For what is our hope or joy or CROWN OF BOASTING before our Lord Jesus at his coming? Is it not you?" Do the apostles get a crown in which to boast because they had won others to the Lord? Philippians 1:26 KJB, NKJV, many others: "That your REJOICING may be more abundant in Jesus Christ for me by my coming to you again." NASB "so that YOUR PROUD CONFIDENCE in me may abound"
RSV, ESV "you will have ample CAUSE TO GLORY"
Here the NIV has "your JOY in Christ will overflow" which is perfectly acceptable. Rejoicing is not the same as proud confidence. Greek words often have multiple meanings, and the ones used in these verses can mean to glory, to boast, to joy, or to rejoice, depending on the context and intent. All the modern versions will at times render these words as "to rejoice", "to joy", or "to exult". It is when they translate them so as to make pride and boasting in oneself a Christian virtue rather than a sin that they clearly have perverted the true words of God. Philippians 2:16 KJB, Tyndale, Coverdale, Bishop's, Geneva, Young's, Webster's, KJV 21, NKJV, and theThird Millenium Bible : "that I may REJOICE in the day of Christ, that I have not run in vain, neither laboured in vain." NASB: "in the day of Christ I may have REASON TO GLORY because I did not run in vain"
NIV: "in order that I MAY BOAST in the day of Christ that I did not run or labor for nothing." RSV, ESV "so that in the day of Christ I MAY BE PROUD that I did not run in vain." Nobody will be boasting or proud of his personal accomplishments in the day of the Lord Jesus; we will all be flat on our faces worshipping the Lamb who alone is worthy to receive praise, honour and glory. 4. Hebrews 4:8 "For if JESUS had given them rest..."
Bible correctors frequently drag out this dead fish and try to raise a stink about how the King James Bible is in error when it refers to "JESUS" bringing the children of Israel into the promised land. These noted scholars try to place you in the position that you can never read your Bible and know for certain, "Thus saith the Lord", unless you first consult with them to find out if you have the correct text they approve of, and that the text that you have is translated properly according to what they declare to be the correct rendering. Yet none of them believe any single Bible out there is totally infallible and without error. They themselves become the Final Authority for what God REALLY said. In Hebrews 4:8 we read: "For if Jesus had given them rest, then would he not afterward have spoken of another day." Likewise in Acts 7:45 we have: "Which also our fathers that came after brought in with Jesus into the possession of the Gentiles, whom God drave out before the face of our fathers, unto the days of David." The Greek texts all literally have the name JESUS in these two places, though the contexts refer to the man Joshua. Joshua himself is a pictoral "type" of our Lord Jesus Christ. Joshua, along with Caleb, did believe God had given them the promised land, but the rest of the people entered not in because of unbelief. Later this same Joshua ('Jesus' in Greek) led the people into the land. The promised land typifies the spiritual rest from our own works which was accomplished by the greater Jesus, the Son of God Himself. Other Bible versions that read JESUS in Acts 7 and Hebrews 4 like the King James Bible are Wycliffe 1395, the Great Bible, Taverner's Bible, Matthew's Bible, the Bishops' Bible 1568, the Geneva Bible 1599, Webster's 1833 translation, Darby's translation 1890, and the 1950 Douay version. The Spanish 1999 Las Sagradas Escrituras also reads like the KJB, having: "Porque si Jes"s les hubiera dado el Reposo..."
Joshua himself was called by four different names including Jeshuah Nehemiah 8:17; Joshua in Joshua 1:1; Jehoshuah in Numbers 13:16, and Oshea in Numbers 13:11. He is mentioned only twice in the New Testament, once in Acts 7:45 and again in Hebrews 4:8. In Greek his name translates as Insous, or Jesus in English. This is exactly the same way "Jesus" is spelled in every case. There are also other people in the Bible whose name was Jesus. In Acts 13:6 we come across a false prophet and a sorcerer. He was "a Jew, whose name was Bar-jesus." Bar-Jesus means "son of Jesus". We also meet a fellow Christian worker in the book of Colossians 4:11 - "And Jesus, which is called Justus, who are of the circumcision." In the genealogy of Christ, the Traditional texts, the Majority of all manuscripts including A, and the Syriac all read like the King James Bible, by mentioning "the son of Er, which was the son of JOSE..." (or Joseph). However the corrupt manuscripts of Sinaiticus and Vaticanus read: "the son of Er, the son OF JESUS", and so do the RV, ASV, RSV, Goodspeed, and the J.W. versions. The NASB, NIV have changed this to read: "the son of JOSHUA". It is obvious that many people in the Bible were called by several names, as Peter, Cephas, Simeon, and Simon Barjona (all one man), and that there were many people with the same name. It is not too hard to figure out who is who just by reading the context. Both Hebrews 4:8 and Acts 7:45 the literal Greek "Jesus" refers to the man Joshua, who himself believed God and is the "type" of the true Jesus, who indeed does lead us into the promised land and gives us rest from our own labours. The type and the antitype both have the same name. God Himself inspired the Bible in this way to teach a spiritual lesson. John Gill remarks in his commentary that Joshua " was an eminent type of Jesus Christ. There is an agreement in their names, both signify a saviour, Joshua was a temporal saviour, Christ a spiritual one; and in their office they were both servants; and in their qualifications for their office, such as wisdom, courage, faithfulness, and integrity. Joshua was a type of Christ in many actions of his life; in the miracles he wrought, or were wrought for him; in the battles he fought, and the victories he obtained." The King James Bible and all the others are not in error, as some allege. Rather it gives a literal translation of the Greek name Joshua, and reveals the "type" or divine foreshadowing of the fulfillment which was completed in the Son of God. "Let this mind be in you, which was also in Christ Jesus: Who, being in the form of God, THOUGHT IT NOT ROBBERY TO BE EQUAL WITH GOD: but MADE HIMSELF OF NO REPUTATION, and took upon him the form of a servant, and was made in the likeness of men." The phrase "thought it not robbery to be equal with God", as found in the King James Bible, clearly teaches that Jesus Christ was in fact God. Notice the comments of a couple of orthodox commentators.
" He thought it not robbery to be equal with God; did not think himself guilty of any invasion of what did not belong to him, or assuming another"s right. He said, I and my Father are one, Jn. 10:30. It is the highest degree of robbery for any mere man or mere creature to pretend to be equal with God, or profess himself one with the Father. This is for a man to rob God, not in tithes and offerings, but of the rights of his Godhead." "Thought it not robbery to be equal with God" is not only the reading of the King James Bible but also of Tyndale 1525, Coverdale 1535, the Bishop's Bible 1568, the Geneva Bible 1587, Young's, Hebrew Names Version, Lamsa's translation of the Syriac Peshitta, Third Millenium Bible, Webster's 1833 translation, Wycliffe, and the NKJV 1982 edition (but not the 1979 NKJV). By being equal to God, Jesus Christ was not stealing or taking something that did not belong to Him. He was and is equal to God the Father. However many modern versions give us a rendering that means the exact opposite. I am presently in a discussion with a Jehovah Witness who, of course, denies that Jesus Christ is God. He says: "As for Philippians 2:6, the ambiguity is simply one that is shared by many translators and exegetes. The Harper Collins Study Bible NRSV states that some of the key words used here "had puzzled interpeters" and are "problematic." The New World Translation, which the JW's use, says: "although he was existing in the form of God, gave no consideration to a seizure, namely, that he should be equal to God." Then he proceeds to show the readings found in many modern versions. NASB " did not regard equality with God a thing to be grasped"
Revised Standard Version "did not count equality with God a thing to be grasped"
New Jerusalem Bible "did not count equality with God something to be grasped"
Emphatic Diaglott "yet did not meditate a Usurpation to be like God"
21st Century Free " he never even considered the chance to be equal with God." Revised Version "counted it not a prize to be on an equality with God." Goodspeed "he did not grasp at equality with God." NKJV 1979 edition "did not consider equality with God something to be grasped." NIV "did not consider equality with God something to be grasped". Keep in mind that this is a Jehovah Witness who is using these modern version to support his view that Jesus Christ was not God! To get a clearer idea of just how different in meaning the phrase is, "thought it not robbery to be equal with God" from "did not consider equality with God something to be grasped" compare the following statements. "The black man thought it not robbery to be equal with the white man." In other words, he was not stealing something that did not belong to him; he is equal to the white man. "The black man did not regard equality with the white man a thing to be grasped." He didn't even try and thought it way beyond him. The meaning found in the NASB, NIV, NKJV 1979 edition, ESV, RSV is totally different from the one found in the King James Bible and others which reveal the full deity of our Lord Jesus Christ. Another change in meaning is found in verse 7 where we are told that Christ "MADE HIMSELF OF NO REPUTATION". This is one of those "ambiguous, problematic" passages that the JW guy says has puzzled interpreters. The verb used here has variously been translated as "to be made void", "to be made of none effect", "to be in vain" and "made of no reputation". The King James translators got it right and many other versions give us a nonsensical reading. Other Bibles that exhort us to follow the example of Christ, who "MADE HIMSELF OF NO REPUTATION" are Tyndale, Coverdale, Bishops', the Geneva Bible, NKJV 1982 edition (but not the 1979 NKJV), Lamsa's translation of the Peshitta, Webster's 1833 translation, the KJV 21st Century Version, and the Third Millenium Bible. The Wycliffe Bible of 1395 says: "He lowered Himself,taking the form of a servant". However instead of "made himself of no reputation", the NIV, NASB, RSV, and NKJV 1979 edition again match the New World Translation of the JWs. They say Christ "emptied himself" (NASB, NKJV 79, RSV, NWT) or "made himself nothing" (NIV). Now if Christ made himself nothing or emptied himself, there was NOTHING THERE. If I empty a box, what remains? Nothing. The Lord Jesus Christ was not empty or nothing when He came to earth. He was full of grace and truth. In Him dwelt all the fullness of the Godhead bodily. But He did make Himself of no reputation. He was born in a stable, from a common and poor family; He came not to seek His own glory but that of His Father, and He often told others He had healed to tell no one. When the multitudes wanted to make Him king, He departed into a mountain alone. How different from our sinful tendency to want to be recognized, make a name for ourselves, and have others look up to us as some great one. Not all bibles teach the same thing. Many modern versions continually downgrade the glory and deity of our Lord Jesus Christ. The King James Bible exalts the Lord Jesus Christ to His rightful place as "God manifest in the flesh" 1 Timothy 3:16. Compare the NASB, NIV and NWT here for such an example. See also Romans 14:10, 1 John 5:7, 1 Cor. 15:47 and Luke 23:42. "Wherefore God also hath highly exalted him, and given him a name which is above every name: that at the name of Jesus every knee should bow...and that every tongue should confess that Jesus Christ is Lord, to the glory of God the Father." Exodus 3:22 "But every woman shall BORROW of her neighbour, and of her that sojourneth in her house, jewels of silver, and jewels of gold, and raiment: and ye shall put them upon your daughters; and ye shall spoil the Egyptians." See also Exodus 11:2 and 12:35. "The Israelites "borrowed" from the Egyptians (Ex. 12:35, R.V., "asked") in accordance with a divine command (3:22; 11:2). But the word (sha'al) so rendered here means simply and always to "request" or "demand." The Hebrew had another word which is properly translated "borrow" in Deut. 28:12; Ps. 37:21. It was well known that the parting was final." Christian Answers Net is completely wrong when they say the word shaal means SIMPLY AND ALWAYS to request or to demand. Not only has the King James Bible translated this word shaal as to borrow, but so has the NASB, NIV, NKJV and an host of other bible versions both old and new. For example, the NASB has translated this same word as "borrow" three times. So too the NKJV, and the NIV twice. Exodus 22:14 "And if a man BORROW ought of his neighbour, and it be hurt, or die, the owner thereof being not with it, he shall surely make it good." In 2 Kings 4:3 the prophet Elisha tells the widow woman: "Go, BORROW thee vessels abroad of all thy neighbours..." and again in 2 Kings 6:5 when one was felling a beam, "the axe head fell in the water, and the man cried out, and said, Alas, master! for it was BORROWED." The NASB, NIV, NKJV etc. certainly do not "always" translate this word as to request or to demand, but also as to "ask, beg, borrow, consult, dedicate, desire, greet, give, granted, inquire, lent, looks, a medium, obtain decisions, pray, question, require, said, sought, tell, took, and wish." Another site called Christian Courier says: "The KJV suggests that the Israelites were to "borrow" certain objects from the Egyptians. But there was never any intention of repayment. The King James translation is poor here; later renditions, including the NKJV, translate the verb sa"al by "ask"." In answer to this alleged error in the King James Bible, let's first look at other Bible versions that agree with the KJB reading and then offer some explanations as to why the King James Bible is not in error at all. William Tyndale 1530, Miles Coverdale 1535, the Bishops' Bible 1568, Webster's 1833 translation, Lamsa's 1933 translation of the Syriac Peshitta, the 1936 Hebrew Publishing Company translation, the KJV 21st Century version, and the Third Millenium Bible. Some previous English versions like Wycliffe and the Geneva bible read "ask", so the KJB translators were not unaware of this reading, but deliberately and providentially chose to translate it as "borrow". In The Book of Bible Problems, Gerardus D. Bouw, Ph.D., explains on pages 32-33: "It has long puzzled critics that Exodus 3:22 says that the Israelite women BORROWED jewels from their Egyptian neighbors, for to borrow means that there will be a time to pay them back. Much of the silver and gold carried from Egypt went into the construction of the tabernacle, which later was used in the temple. In 1 Kings 14:25-26 we have the record of the Israelites repayment to the Egyptians." He then quotes the passage which says: "And it came to pass in the fifth year of king Rehoboam, that Shishak king of Egypt came up against Jerusalem: And he took away the treasures of the house of the LORD, and the treasures of the king's house; he even took away all: and he took away all the shields of gold which Solomon had made." Just as in Genesis the Lord predicted the sojourning of the nation of Israel in the land of Egypt and their departing from it with great substance, so also in Exodus is the veiled prophecy of their returning to the Egyptians what they had once "borrowed". In Genesis 15:14, hundreds of years before it happened, God told Abraham "And also that nation, whom they shall serve, will I judge: and afterward shall they come out with great substance." We see the fulfillment of this in Exodus 3:21-22 where God tells Moses: "And I will give this people favour in the sight of the Egyptians: and it shall come to pass, that, when ye go, ye shall not go empty...and ye shall spoil the Egyptians." Everything we have is on loan from the Lord; nothing is really ours but everything is borrowed. God tells His people in Deuteronomy 8:17-18 to beware that they forget not the LORD "And thou say in thine heart, My power and the might of mine hand hath gotten me this wealth. But thou shalt remember the LORD thy God; for it is he that giveth thee power to get wealth..."
We are again reminded of this truth when David prays before the congregation after they had amassed treasures for the building of the temple. King David says to God: "Both riches and honour come of thee, and thou reignest over all...But who am I, and what is my people, that we should be able to offer so willingly after this sort? for all things come of thee, and OF THINE OWN have we given thee...O LORD our God, all this store that we have prepared to build thee an house for thine holy name cometh of thine hand, AND IS ALL THINE OWN." 1 Chronicles 29:12-16. The modern versions like the NKJV, NIV, NASB that say: "But every woman SHALL ASK of her neighbor..articles of silver, gold...So you shall plunder the Egyptians" actually miss the mark. If we merely "ask" for something, that doesn't mean we will necessarily get it. If we borrow something, we do get it. The King James Bible and all the others that have correctly translated this word as "borrow" not only allude to the prophetic fact that the treasures of Egypt would one day be returned, but also convey the Biblical idea that everything we have is on loan from the Lord and it all belongs to Him. 7. No Doctrines Are Changed? I often hear those who criticize the King James Bible and defend the multiple modern versions say: "Well, no doctrines are changed in the different versions." But is this true? There are presently well over 100 different English bible versions available to the general public and none of them agrees with the others in both text and meaning in hundreds of verses. This is easily proved and well noted by many atheist, Muslim and Bible basher sites on the internet. Which of these different bibles is really the inspired, inerrant words of God? Or have the complete, pure, inerrant words of God been lost in the shuffle and God has failed to preserve His words as He promised? Is it true that "no doctrines are changed" in the various conflicting versions? Some Christians say, "Well, only the originals were inspired." Since we don't have any of the originals and nobody knows what they really said, how can we then say the Bible is the inspired word of God? Shouldn't we say the bible WAS the inspired word of God? I and thousands of other Christians believe God has kept His promises to preserve His words and He has done so in the King James Holy Bible. In general terms the overall state of textual evidence and ancient versions is overwhelmingly on the side of the King James Bible readings as opposed to such versions as the NASB, NIV, RSV, ESV, and ISV. However, one can argue back and forth over the textual evidence till you are either blue or red in the face, and prove nothing. For me and many other Bible believers, we clearly see the Providential hand of God placing His divine approval upon the King James Bible that has been universally recognized as THE BIBLE of the English speaking world for almost 400 years. One of the clear and convincing proofs that the King James Bible is the complete, inerrant, and pure words of God is the purity and truth of its Christ exalting doctrines. Proverbs 14:5 tells us: "A faithful witness will not lie: but a false witness will utter lies." There are many lies found in the new bible versions and it is the accumulation of such lies that reveal them to be false witnesses to the whole truth of God. Modern versionists say they are examining the evidence to come up with the best text to restore the words of God. The problem with this is, the new versions continue to disagree with each other in both texts and meaning in a multitude of places. I believe God has already gone through this process using the men He chose to bring forth the King James Bible. If God has already done this in order to preserve His words and carry out the great modern missionary movement from the late 1700's to the mid 1900's, there is no need to do it again, unless He decides to put His complete words into a language other than English. Some speak of the same General Message being found in all "reliable" versions. True, the simple gospel can be found in them all. Yet in all of them we also find contradictions concerning the basic truths of the character of God and we find corruptions of other sound doctrines. The "Any Bible Will Do" position leads to uncertainty, doubt and unbelief. There are a multitude of contradictory versions, with several whole verses being found in some that are not in others. Seventeen entire verses, and about half of another 50 are omitted from the New Testament in the NIV, NASB, and even more in the RSV, ESV when compared to the King James Bible, Tyndale, Bishop's, Geneva, Webster's, the NKJV, and the Third Millenium Bible. The examples in the following list, except Luke 2:22, and John 7:8, are not the result of different Greek and Hebrew texts being used, as is often the case, but rather of different ways the same underlying texts have been translated into English. As Pilate asked his wife in the movie the Passion of the Christ: "Can you recognize truth when you hear it?" Does the true Lord Jesus Christ have "ORIGENS from ancient times" as taught in Micah 5:2 by the NIV, RSV, ESV, and Jehovah Witness New World Translation, or were His "goings forth from everlasting" as the King James Bible, NKJV, NASB have it? One rendering teaches His eternality, while the other says He has an origen or a beginning. Is the Jesus Christ in your Bible the one who lied in John 7:8 as the NASB and ESV read? The King James Bible, NIV, RV, ASV and NKJV have Jesus saying: "Go ye up unto this feast: I go NOT UP YET unto this feast; for my time is not yet full come". Then in verse 10 "But when his brethren were gone up, then went he also up unto the feast, not openly, but as it were in secret." However the NASB, ESV have Jesus saying: "I do NOT GO up to this feast... But when His brothers had gone up to the feast, then He Himself also went up". Did the Lord Jesus Christ need a blood sacrifice to be cleansed from sin in Luke 2:22 as the NASB, ESV, NIV teach? These versions read: "when the days for THEIR purification according to the law of Moses were completed...to offer a sacrifice", as opposed to the King James Bible, the NKJV, Bishop's Bible 1568, the Geneva Bible 1599, Webster's 1833 translation, and the Third Millenium Bible which have "when the days of HER purification according to the law of Moses were accomplished...to offer a sacrifice". Wycliffe's 1395 translation says "the days of the purification of Mary". The only Old Testament reference for this sin offering to make an atonement is found in Leviticus 12:6-8 where the woman alone offered a sin offering for her purification. Can God be deceived as the NASB teaches in Ps. 78:36? The NASB says the children of Israel DECEIVED GOD with their mouths, but the NKJV, KJB, NIV, RV, ASV, ESV all say they "flattered" God with their mouths and lied unto Him. You can flatter God by saying nice things about Him but not obeying Him, but you certainly cannot deceive God. Is the Lord Jesus Christ the ONLY BEGOTTEN SON of God BEFORE His incarnation? The NIV never refers to Christ as "the only begotten Son". Christ was the only begotten Son from all eternity, but not in the NIV. The NIV, ISV, and Holman Standard pervert true doctrine in Acts 13:33 where the Bible speaks of the resurrection of Christ. He was quickened from the dead and raised again to life to become "the first begotten of the dead" (Revelation 1:5), and "the firstborn from the dead (Colossians 1:18). In Psalm 2 and Acts 13:33 God says and ALL GREEK TEXTS read: "God hath fulfilled the same unto us their children, in that he hath raised up Jesus AGAIN: as it is also written in the second Psalm, Thou art my Son, THIS DAY HAVE I BEGOTTEN THEE". This is the reading found in the RV, ASV, RSV, NRSV, ESV, NASB, NKJV. The specific Day that Christ was begotten from the dead was that first Easter morning. However the NIV, and now the new ISV (International Standard Version) and the upcoming Holman Christian Standard Version actually say "Today I HAVE BECOME YOUR FATHER"!!! The NIV, ISV, and Holman version here teach that there was a time when God was not the Father of Christ. This is also the reading of the Jehovah witness version, the New World translation, and they use this verse and Micah 5:2, which also reads the same in their version as does the NIV, to prove that Jesus Christ is a created being and not from everlasting. Another doctrinal error is found in the NKJV, NIV, NASB, ESV and others in 2 Samuel 14:14. The context is Absalom had slain Amnon because he raped his sister Tamar. Absalom fled to Geshur and was there for three years, yet the soul of king David longed for his son Absalom. Joab decides to put words in the mouth of a wise woman from Tekoah and he sends her to speak to the king. In the course of their conversation the woman tells king David: "the king doth speak this thing as one which is faulty, in that the king doth not fetch home again his banished. For we must needs die, and are as water spilt on the ground, which cannot be gathered up again; NEITHER DOTH GOD RESPECT ANY PERSON: yet doth he devise means, that his banished be not expelled from him." The meaning is pretty straightforward. We all must die and God does not respect any person or show partiality to one more than another in this regard. 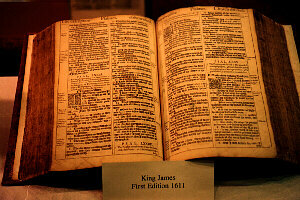 Other Bible versions that read as the King James Bible are the Geneva Bible of 1599, the Jewish Publication Society of America's 1917 translation, Young's "literal" translation, Daniel Webster's 1833 translation, the Spanish Sagradas Escrituras, the KJV 21st Century version and the Third Millenium Bible. However when we get to the NewKJV, ESV, the NIV and the NASB instead of "neither doth God respect any person" they read "YET GOD DOES NOT TAKE AWAY LIFE". This is untrue and a contradiction. Just two chapters before this event we read of the child born to David in his adulterous affair with Bathseba that "the LORD struck the child, and it was very sick" and on the seventh day it died. (2 Samuel 12:15). In Deuteronomy 32:39 God Himself says: "I kill, and I make alive; I wound, and I heal: neither is there any that can deliver out of my hand." In Genesis 38:7 and 10 we read of two wicked sons of Judah, Er and Onan "and the LORD SLEW him", and "wherefore he slew him also." 1 Samuel 2:6 tells us: "The LORD killeth, and maketh alive: he bringeth down to the grave, and bringeth up." And 2 Samuel 6:7 says: "And the anger of the LORD was kindled against Uzzah. and God smote him there for his error: and there he died by the ark of God." God obviously does take away life, and the NKJV, NIV and NASB are all in error in 2 Samuel 14:14 where they say that He doesn't take away life. In 2 Peter 3:12 the King James Bible, Tyndale, Geneva and others correctly say we are "looking for and HASTING UNTO the coming of the day of God". The date is already fixed in God's timetable and nothing we can do will make it come any faster. It is we who in our fleeting lives are fast moving towards that day. However the NKJV, NIV, NASB all teach that we can "speed" or "hasten" the coming of the day of God. This contradicts numerous other Scriptures and is a false doctrine. Who rules or is in control of this world, God or Satan? In I John 5:19 the King James Bible along with the Tyndale 1525, Bishop's Bible 1568, the Geneva Bible 1599, Young's, the Spanish Reina Valera of 1602, and 1909 (y todo el mundo est" puesto en maldad), Lamsa's translation of the Peshitta, Webster's 1833 translation, the Douay-Rheims 1950, the KJV 21st Century version, Green's literal translation and Green's Modern KJV, and the Third Millenium Bible all say: "And we know that we are of God, and THE WHOLE WORLD LIETH IN WICKEDNESS." Miles Coverdale's 1535 translation says: "We know that we are of God, and the whole world is set altogether in wickedness." We live in a fallen world; it lies in sin and wickedness, just as the text says. But God is still in control and ruling over all His creation. "He worketh all things after the counsel of his own will" Ephesians 1:11. Daniel 4:17,25,26 tell us three times that "the most High ruleth in the kingdom of men, and giveth it to whomsoever he will." Even though it may appear that wickedness is winning, the eye of faith sees His sovereignty and rejoices in this confidence. However, believe it or not, many new versions change the truth of God's sovereign rule and would have us believe that Satan is the ruler of this world and is in control. In fact, they come right out and say it in these exact words. The NIV says: "The whole world is UNDER THE CONTROL OF THE EVIL ONE." NASB " the whole world lies in the power of the evil one." Today's English Version "the whole world is under the rule of the Evil One." ESV (English Standard Version) "the whole world lies in the power of the evil one." Living Bible 1981 "the world around us is under Satan's power and control." ISV (International Standard Version) "the whole world lies under the control of the evil one." The NKJV, and the Holman Christian Standard Bible try to strike a medium with : " the whole world lies under the sway of the wicked one" but the NKJV as well as the NASB are also wrong when three times they refer to Satan as the "ruler of this world" in John 12:31; 14:30, and 16:11. Satan is NOT the ruler of this world. He is the spiritual "prince of this world", as the KJB, RV, ASV, Tyndale, Geneva, and even the NIV correctly say, but there are also other spiritual "princes" or beings working among the nations, and all of them are under the control of God and not Satan. What is the fine linen, clean and white? Our only hope of righteousness before God is to be clothed with the imputed righteousness of Christ. Revelation 19:8 speaks of the church of God, the wife of the Lamb being arrayed in fine linen, clean and white. "for the FINE LINEN IS THE RIGHTEOUSNESS OF SAINTS." Versions that read like the King James Bible are Tyndale's New Testament of 1534, Miles Coverdale 1535, Bishop's Bible 1568, the Geneva Bible of 1599, John Wesley's 1755 translation, Green"s interlinear, Webster's translation of 1833, the Spanish Reina Valera of 1909, the Bible in Basic English 1970, Lamsa's translation of the Syriac Peshitta, the Third Millenium Bible, the 21st Century KJV, and even the modern paraphrase called The Message. But the NKJV, NASB, ESV, ISV, Holman Christian Standard Bible, and the NIV have, "the fine linen is the RIGHTEOUS ACTS of the saints." (or "the righteous deeds of God's people") If our righteous acts are going to make up our wedding dress, it will be pretty soiled and tattered. At the very least, you have to admit that not all these versions teach the same thing here. So, which one is true? Matthew Henry notes: "You have here a description of the bride, how she appeared in fine linen, clean and white, which is the righteousness of saints; in the robes of Christ"s righteousness... She had washed her robes and made them white in the blood of the Lamb; and these her nuptial ornaments she did not purchase by any price of her own, but received them as the gift and grant of her blessed Lord." John Gill comments: "for the fine linen is the righteousness of saints, not good works, or their own righteousness;... these are not comparable to fine linen, clean and white, but are like filthy rags, and cannot justify in the sight of God; but the righteousness of Christ is meant, and justification by that; for that is the only justifying righteousness of the saints. "Christ's righteousness may be compared to fine linen, clean and white... all the Lord's people will be righteous, they will have on the best robe, and wedding garment, and their being arrayed with it will be owing to the grace of Christ, who grants it. Not only the garment is a gift of grace, but the putting of it on is a grant from Christ, and what he himself does, (Isaiah 61:10) (Zechariah 3:4)." 1 Corinthians 8:4 "we know that an idol is nothing in the world" - this is the meaning found in the Geneva Bible, Holman Christian Standard, Darby, NIV, NKJV, and even the Douay version too. However the NASB says: "there is no such thing as an idol in the world". No idols in the world, huh? Is Judah faithful to God as the KJB, RSV, ESV, NKJV teach - "but Judah yet ruleth with God and is faithful with the saints" or "Judah is UNRULY with God, even AGAINST the Holy One who is faithful" as the NASB, NIV teach in Hosea 11:12? Daniel 9:26 "shall Messiah cut off, but NOT FOR HIMSELF"
An extremely important Messianic prophecy about the significance of the death of Christ has been drastically changed in a multitude of conflicting modern versions. "And after threescore and two weeks shall Messiah be cut off, BUT NOT FOR HIMSELF." The Messiah, the Lord Jesus Christ, was killed not for Himself but for His people. He laid down His life as a ransom for many. He gave Himself for the church, laid down His life for the sheep, and purchased the church of God with His own blood. There is no verb in the Hebrew text here. It reads "but not for himself". This is also the reading of the Bishop's Bible 1568, the NKJV 1982, Spanish Reina Valera 1960 (se quitar" la vida al Mes"as, mas no por s"), Webster's 1833 translation, the Third Millenium Bible and the KJV 21. Even the NIV footnote gives the reading of the King James Bible "or, cut off, but not for Himself", but the text of the NIV reads quite differently. Christ was to make reconciliation for iniquity and bring in everlasting righteousness, as verse Daniel 9:24 tells us. Matthew Henry comments: "In order to all this the Messiah must be cut off, must die a violent death, and so be cut off from the land of the living, as was foretold, Isaiah 53:8 - "for he was cut off out of the land of the living: for the transgression of my people was he stricken." He must be cut off, but not for himself " not for any sin of his own, but, as Caiaphas prophesied, he must die for the people, in our stead and for our good, it was to atone for our sins, and to purchase life for us, that he was cut off." John Wesley tersely remarks: " Not for himself - But for our sakes, and for our salvation." David Guzik's Commentary says simply: "The Messiah will be cut off for the sake of others, not for Himself." John Gill offfers this explanation first: " when Jesus the true Messiah was cut off in a judicial way; not for any sins of his own, but for the sins of his people, to make satisfaction for them, and to obtain their redemption and salvation." However, the NIV, RSV, NRSV, ESV, NASB read: "Messiah shall be cut off AND HAVE NOTHING." Messiah shall have nothing?!? He purchased His people and bought His bride with His own blood! He certainly did not "have nothing". Here are some other "bible versions" and their readings for comparison. See if this clears things up for us and verifies the statement made by some that "There are no conflicting bibles". Coverdale 1535 "Christ shall be slain AND THEY SHALL HAVE NO PLEASURE IN HIM." The Message 2002 - "After the sixty-two sevens, the Anointed Leader will be killed--THE END OF HIM." New English bible 1970- "one who is anointed shall be removed WITH NO ONE TO TAKE HIS PART." Young's - "cut off is Messiah AND THE CITY AND THE HOLY PLACE ARE NOT." New American Bible - "an anointed one shall be cut off WHEN HE DOES NOT POSSESS THE CITY." Douay 1950 - "Christ shall be slain AND THE PEOPLE WHO DENY HIM SHALL NOT BE HIS." Lamsa's 1933 - "Messiah shall be slain AND THE CITY SHALL BE WITHOUT A RULER." The Septuagint (LXX) - "the anointed one shall be destroyed AND THERE IS NO JUDGMENT IN HIM." Men like James White tell us that by comparing all the bible versions we get a much better idea of what God really said. Do you think all these bibles have the same general message and clarify the true meaning for us? This is the type of foolishness being promoted by those who tell us there are no conflicting bible versions and that they all have the same ideas but with different words. This one example can easily be repeated a hundred times over with many individual verses. These are just a few of the problems you have if you think God is the one directing the modern versionists. This God seems more than a little confused and muddled in his thinking. He can't seem to make up his mind as to what he said or meant. If you think all these modern versions are from God, you have no sure words and your case is getting worse all the time as new versions continue to roll off the presses which in turn contradict the previous ones. Isn't there something written in the Bible that tells us of the falling away from the faith in the last days? Has Satan changed his hateful opposition and corrupting influence toward the words of God? Has man "evolved" to a higher state in these latter days to where he can now think more clearly? If the gospel of salvation in Jesus Christ is found only in the Bible, and this "bible" contains contradictions, false information, completely different meanings in hundreds of places, verses found in some but not in others, then how do we know the gospel of which it speaks is true? If God hasn't kept His promises to preserve His words, then how do you know God will keep His promise to preserve your soul? When does God start telling the truth? Do you still think that "no doctrines are changed" in the various versions? Is the Bible the inspired, inerrant words of God? If so, what exactly are you referring to when you say this? Some mystical bible that exists in your own mind, or a solid Book we can hold in our hands, read, believe and preach to a lost world? the devils also believe, and TREMBLE." The title of the article over there is off base as well. We King James Bible believers don't hold that the KJV translators were inspired; so they are making a straw man argument to begin with. It is God's words that are inspired, not the translators. Mr. Rudd asks: "Why do KJV only advocates believe that the English of the KJV is clearer and more precise than the original Greek language manuscripts? Why should Bible students throw out their Greek dictionaries and buy an "archaic English" dictionary? Are there not word pictures in the original Greek words that the English cannot easily convey? (James 2:19 "tremble"; Greek: PHRISSO, indicates to be rough, to bristle. It is a powerful word picture of how the demons are in such terror that their skin is rough with goose pimples." In answer to Mr. Rudd's deep insights we should point out a few things. First of all, Mr. Rudd implies by the phrase "the original Greek language manuscripts" that such an animal actually exists. They don't. There are no "THE ORIGINAL manuscripts" that Mr. Rudd nor anyone else has to examine. There are presently over 25 very different Greek texts available, and thousands of manuscripts that often differ from one another in thousands of words. Mr. Rudd therefore directs us to a source in which there is maximum uncertainty and widespread disagreement. Secondly, Mr. Rudd will find great variety of differences even among the Greek dictionaries he alludes to, and I hardly think the English word "to tremble" is archaic. Mr. Rudd seems a bit too eager to overstate his case. Thirdly, Mr. Rudd reveals much about his position by the question he asks: "Why should Bible students throw out their Greek dictionaries and buy an archaic English dictionary?" Here he shows that he considers "Bible students" to be those who can read Greek, which is much more difficult than our native English language. What about all those who have never been to seminary and don't know Greek? Can't they also be Bible students? Is learning a few "archaic words" in English more difficult than learning the new alphabet and foreign language of New Testament Greek, which is itself "archaic" and no longer the spoken form among Greeks today? Fourthly, Mr. Rudd's "word picture" is merely his own personal interpretation and, unfortunately for him, many other "scholars" who have equal access to Mr. Rudd's Greek dictionaries fail to see the same word picture he insists we see. I have consulted a large number of Bible translations and so far have failed to find a single one that translates James 2:19 as "the devils also believe and ARE SO TERRIFIED THEY GET GOOSE PIMPLES." Looking at just one of the Greek dictionaries Mr. Rudd alludes to we find the following information. I refer to the large volume of Liddell and Scott Greek-English Lexicon 9th edition 1940 on page 1955. There they state that this word phrisso has many different meanings depending on the context. In regards to hair - to bristle, to stand on end; of a surface - to be rough or uneven; of cold - to shiver; of teeth - to chatter; of fear - to shudder; to feel a holy awe at or to fear; of water - to ripple; of love - to thrill or quiver with delight. Thayer's Lexicon likewise gives the definition: "to be struck with extreme fear or to be horrified". Many modern versions like the RV, ASV, NASB, NIV, RSV say the demons believe and SHUDDER. I looked up the meaning of the word "to shudder" and the dictionaries say it means "to tremble as from horror, fear, or cold." Now if Mr. Rudd or anyone else thinks "to shudder" is better and less archaic than "to tremble", let them please tell us how this is an improvement over the King James rendering. Among the Bible versions that say the devils "also believe and TREMBLE" are Wycliffe 1395, Tyndale 1525, Coverdale 1535, Bishop's Bible 1568, the Geneva Bible 1599, the NKJV 1982, Green's interlinear 1980, Webster's 1833, Wesley's 1755, Darby, Lamsa's 1933 translation of the Syriac Peshitta, Douay version 1950, Spanish Reina Valera 1960(tiemblan), the KJV 21, and the Third Millenium Bible. Many other modern versions give a similar rendering. 1. They themselves have no single Bible translation, or single Hebrew or Greek text anywhere on this earth they consider to be the infallible, complete words of God. 2. They feel they belong to a superior class of Christians who are in authority to tell others what God REALLY said. 3. They place their own personal opinions above any single Bible translation and, as a result, make themselves the Final Authority. 4. Their personal opinions and preferences are at odds with others who have placed themselves in a similar position of being Bible critics. 5. They leave the common Christians with no infallible, inerrant, complete Holy Bible in which to trust and believe with all their heart. I and many other believers in the Lord and Saviour Jesus Christ have come to the firm conviction that God has indeed kept His promises to preserve His inspired words till heaven and earth pass away, and that they are found in all their fullness and purity in the Authorized King James Holy Bible. This alone is our Final Authority in all matters of faith and practice. It is true that the words "in heaven, the Father, the Word, and the Holy Ghost: and these three are one. And there are three that bear witness in earth" are not found in the majority of remaining Greek manuscripts. However there is very much and weighty evidence for its inclusion. Those who argue that it is not in the majority of texts are being totally inconsistent, to say the least, when they bring up this argument. Most of the people like James White and Daniel B. Wallace who use this majority argument, do not care one bit for the majority of texts and what they might read. They themselves follow the UBS text of Westcott and Hort which itself departs from the majority readings in literally thousands of places. Sure, there are a few minority readings in the King James Bible, but for every one in the KJB there are a hundred minority readings found in the NASB, NIV, RSV, and that is no exaggeration. The Greek texts include 629 (fourteenth century), 61 (sixteenth century), 918 (sixteenth century), 2473 (seventeenth century), and 2318 (eighteenth century). It is also in the margins of 221 (tenth century), 635 (eleventh century), 88 (twelveth century), 429 (fourteenth century), and 636 (fifteenth century). It is also important to note that most of the Greek copies that have existed throughout history are no longer with us today. Several well known Christians mention Greek texts that contained 1 John 5:7 that existed in their days centuries ago. Among these are Theodore Beza, John Calvin and Stephanus. Beza remarks that the reading of 1 John 5:7 is found in many of their manuscripts, Calvin likewise says it is found in "the most approved copies" and Stephanus, who in 1550 printed the Greek text that bears his name, mentioned that of the 16 copies he had access to, 7 of them contained 1 John 5:7. When Cardinal Ximenes planned to print his Polyglot in 1502 he included 1 John 5:7-8. He stated that he had taken care to secure a number of Greek manuscripts; and he described some of these as very "ancient codices" sent to Spain from Rome. Why haven't the manuscript detectives given us a complete list of these "ancient codices"? They must have contained 1 John 5:7. Ximenes printed the verse. 250 AD Cyprian of Carthage, wrote, "And again, of the Father, Son, and Holy Ghost it is written: "And the three are One" in his On The Lapsed, On the Novatians. Note that Cyprian is quoting and says "it is written, And the three are One." He lived from 180 to 250 A.D. and the scriptures he had at that time contained the verse in question. This is at least 100 years before anything we have today in the Greek copies. If it wasn't part of Holy Scripture, then where did he get it? 380 AD Priscillian in Liber Apologeticus quotes "and there are three which give testimony in heaven, the Father, the Word, and the Spirit, and these three are one in Christ Jesus." 415 AD Council of Carthage. The contested verse (1 John 5:7) is quoted at the Council of Carthage (415 A. D.) by Eugenius, who drew up the confession of faith for the "orthodox." It reads with the King James. How did 350 prelates in 415 A.D. take a verse to be orthodox that wasn't in the Bible? It had to exist there from the beginning. It was quoted as "Pater, VERBUM, et Spiritus Sanctus". 527 AD Fulgentius in Contra Arianos stated: "Tres sunt qui testimonium perhibent in caelo. Pater, Verbum et Spiritus, et tres unum sunt." 636 AD Isidor of Seville quotes the verse as it stands in the KJB. Now the "Waldensian," or "Vaudois" Bibles stretch from about 157 to the 1400s AD. The fact is, according to John Calvin's successor Theodore Beza, that the Vaudois received the Scriptures from missionaries of Antioch of Syria in the 120s AD and finished translating it into their Latin language by 157 AD. This Bible was passed down from generation, until the Reformation of the 1500s, when the Protestants translated the Vaudois Bible into French, Italian, etc. This Bible carries heavy weight when finding out what God really said. Theodore Beza, John Wesley and Johnathan Edwards believed, as most of the Reformers, that the Vaudois were the descendants of the true Christians, and that they preserved the Christian faith for the Bible-believing Christians today. Many critics of this passage like to say that 1 John 5:7 occurs in no ancient language version except the Latin. However the newest UBS critical text has now admitted that it is found in some Armenian manuscripts. Dr. Thomas Holland, who recently wrote "Crowned with Glory", a very good book which defends the King James Bible, states: "The strongest evidence, however, is found in the Greek text itself. Looking at 1 John 5:8, there are three nouns which, in Greek, stand in the neuter (Spirit, water, and blood). However, they are followed by a participle that is masculine. The Greek phrase here is oi marturountes (who bare witness). Those who know the Greek language understand this to be poor grammar if left to stand on its own. Even more noticeably, verse six has the same participle but stands in the neuter (Gk. : to marturoun). Why are three neuter nouns supported with a masculine participle? The answer is found if we include verse seven. There we have two masculine nouns (Father and Son) followed by a neuter noun (Spirit). The verse also has the Greek masculine participle oi marturountes. With this clause introducing verse eight, it is very proper for the participle in verse eight to be masculine, because of the masculine nouns in verse seven. But if verse seven were not there it would become improper Greek grammar." Other scholars have recognized the same thing. This was the argument of Robert Dabney of Union Theological Seminary in his book, "The Doctrinal Various Readings of the New Testament Greek" (1891). Bishop Middleton in his book, "Doctrine of the Greek Article," argues that verse seven must be a part of the text according to the Greek structure of the passage. They may say that Dr. So and So went to Dallas Theological Whatever and he doesn't believe 1 John 5:7 should be in the bible. Well, on the other hand, there are many learned men with just as much knowledge who absolutely believe 1 John 5:7 belongs in the Holy Bible. Cyprian - 250 AD, Priscillian -385 AD, Jerome 420 AD, Fulgentius, Cassiodorus, Isidore of Seville, Jaqub of Edessa, Thomas Aquinas, John Wycliffe, Desiderus Erasmus, Lopez de Zuniga, John Calvin, Theodore Beza, Cipriano de Valera, John Owen, Francis Turretin, John Gill, Matthew Henry, Andrew Fuller, Thomas F. Middleton, Luis Gaussen, Frederick Nolan, Robert L. Dabney, Herman C. Hoskier, George Ricker Berry, Edward F. Hills, David Otis Fuller, Thomas Holland, Michael Maynard and Donald A. Waite.